Huffy Basketball Black Slam Jam Rim with Net. #7888S Huffy Slam Jam Red Rim is a great huffy rim replacement. 5/8" (1.6 cm) heavy duty solid steel red Pro Slam rim. Spalding Huffy Slam Jam Rim Standard Diameter Size - 18 inches. Huffy slam jam basketball rim has ultra smooth spring action. 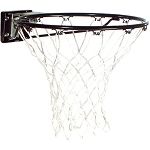 Huffy basket ball rim has universal mounting plate to work with Huffy Basketball Backboards. Basketball breakaway rims have durable, powder-coated finish. The bolt pattern for this unit is square 2-7/8"x2-1/2". These Replacement Huffy Basketball Rims include a White all-weather net. 5/8 solid steel Slam Jam rim is great as a Huffy basketball rims replacement rim for existing systems. Huffy rims are one of the most popular Huffy basketball replacement parts we carry. 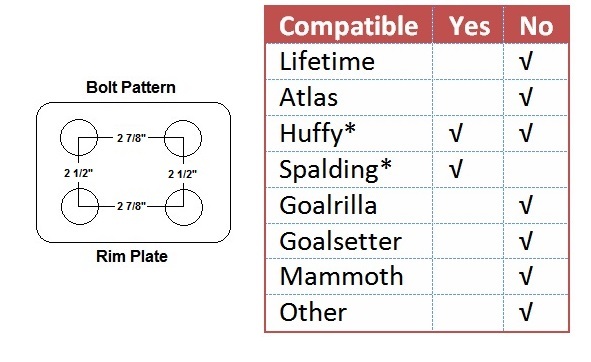 *Is compatible with most Spalding/Huffy models including 88366, 88307PR, 88355, 88349, 88354PR, 88351, 68454, 68564, 72307PR, 66291, 66355, 66349, 72354, 72351, 61259, 79564, 79307, 79355, 79349, 79354, 79351, 80348, 80348, 80318, and 80602R. Please check your bolt pattern before ordering. The Huffy Spalding 7888 Basketball Rim Huffy Replacement unit generally ships via FedEx. Competitive Edge Products is an authorized reseller of Spalding Basketball Accessories. If you find the 7888s Pro-Slam Rim for cheaper anywhere else online, please let us know. We will try to match or beat their advertised price (price of the product + any shipping costs). Works just as described. Its a very strong metal rim. It comes with a decent net and the nuts and bolts. It is much bigger than I thought. A rim on a back board doesnt seem so big, but when you are holding it they are pretty huge. The hoop arrived quickly- on time- and fit perfectly! The measurements they gave for the bolt pattern were right on and the whole thing took about 20 minutes to put together. Great quality, great price. Bought for my 15+ year old Huffy Sports Pole/backboard. This rim fit perfectly and was easy to install. Q: Will this fit the Power Force backboard from about 1998? Q: What is the difference between the 7801s replacement rim and the 7888BS replacement rim? A: Model 7888 is black versus red and a spring-loaded versus fixed. Q: Does this work with any Spalding backboard or huffy backboard? A: It works with most, but not all. Please call 800-558-5234 to find out if it works with your specific board. Fast Shipping: Orders for the Huffy Replacement Rim generally leave the warehouse the next business day.